Only native in extreme northern Delaware, this small tree is commonly planted in urban areas due to its abundant pink flowers and purple spring leaves. 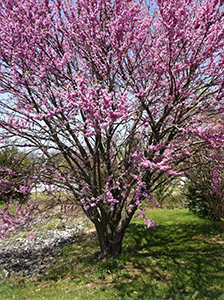 An excellent tree to plant near utility lines, redbud has little wildlife or timber value; however, the flower is a delicacy often eaten in soups or salads. The chief importance of the redbud lies in the ornamental value of its beautiful and abundant flowers, which appear in spring. Redbud leaves have a distinct heart shape with smooth margins. After the flowers bloom, little bean pods appear. The leaves turn yellow before dropping in fall.